In order to seek forgiveness, one has to acknowledge the mistakes that one made and resolve to repair the damage caused. If we Jews don’t forgive Carter, God certainly never will. As our tradition teaches — God will only forgive one who has made peace with those that they wronged. And Jimmy, you have a long, long way to go. Carter’s admission that he has caused the Jewish community harm might work in confession, but doesn’t work with on Yom Kippur, and it doesn’t work with me. Carter admitted no specific mistakes. He offered no way of repairing the damage caused by his irresponsible accusations. 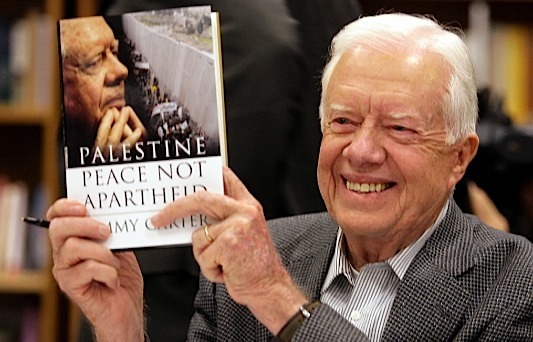 I personally heard Carter tell an audience of 3k students at UC Irvine, to the applause of the administration and students, that the US Congress was “in the pocket” of the Jews. How many other college student audiences around the country heard the same accusations? How many books did he publish accusing Israel of things that have no basis in fact? How many times has he appeared on TV demonizing Israel and backing Hamas? th African Jews, Sephardic Jewish culture, and eat chumous. And that is just for starters. There is a perfect venue for this rapprochement to begin with the Jewish community; the perfect place for Carter to ask forgiveness, renounce his former ways, and promise to live a life free from anti-Semitism and criticism of Israel —Jewlicious Festival 6.0. Friday Night at Jewlicious Jimmy, stand up in front of hundreds and hundreds of young Jews, ask forgiveness, break bread with us, and tell us how you will attempt to undo the vast damage you have wrought.